BreakfastEvery breakfast is served with low fat, hormone-free milk and fresh fruit. 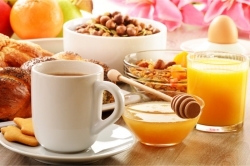 Breakfast items include yogurt, cereal, bagels, and muffins. LunchWe provide our lunch through all major fast food restaurants. We will also be providing nourishing snacks. Every order will be case-by-case, individual basis and in collaboration with the participant’s desire. One of our staff is available to talk to you about your queries. Please call us at 303-537-5078 / 720-297-1002 for more information.